Splatspace and The Scrap Exchange are co-sponsoring a Hebocon event to be held during the Scrap Exchange DIY Fest April 21, 2018. This web page does a good job of conveying the spirit of Hebocon with great videos. The file and web links as well as a link to the organizational guide are on the Splatspace wiki here. 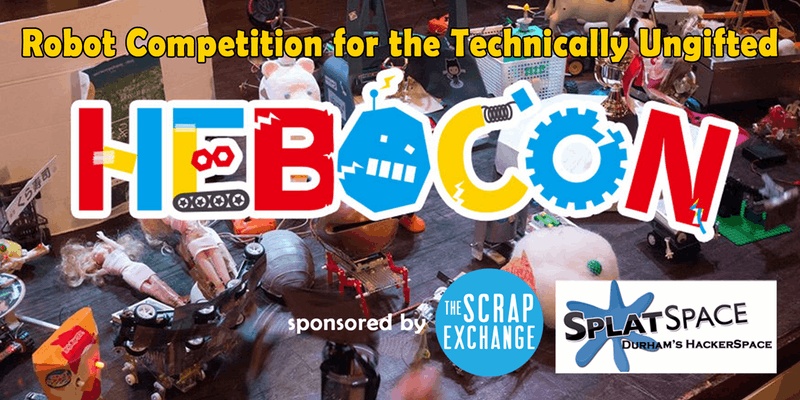 Workshops for making hebocon entries will be held at the TriDIYBio Reuse Arts District Laboratory at 24 Shoppers Street next to Freeman’s Creative near the Scrap Exchange on the three Saturdays before the contest event: March 31, April 7, and April 14 from 1-4pm. Tickets to the workshops are available via Eventbrite. Splatspace members and supporters are invited to attend the three pre-contest workshops to help entrants while organization of the main event and more specific tasks are finalized. Please read the introduction and rules documents to prepare. Splat Space has moved to 800 N. Mangum in Durham! This is a series of informal meetings concerning the creation of a local chapter of the Internet Society. The Internet Society is an international non-profit organization that provides guidance to local governments, education institutions and businesses on issues related to Internet standards and policy. Come to Software Project Night with a software topic you want to talk about because you think it’s cool, or you want to understand it better. Come to Software Project Night if you’re a beginner or an expert programmer: sharing your unique perspective on software is what makes Software Project Night work! 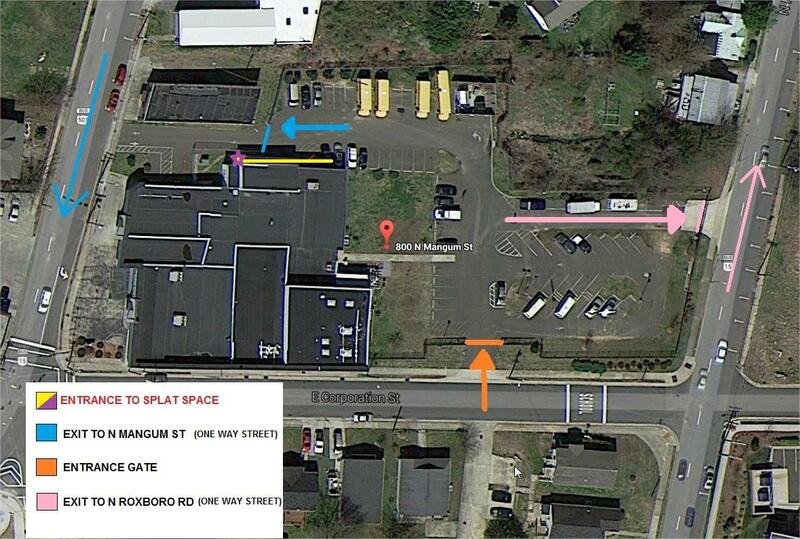 Tuesday, from 07:00PM Splat Space Open Meeting:Splat Space has moved to 800 N. Mangum in Durham! Sunday, from 06:00PM Second Sunday Crafts:Bring your textile, paper, jewelry, fiber, metal, or any type of craft project to the Splat-Space for crafty fun and interesting company! Sunday, from 06:00PM Software Project Night:Come to Software Project Night with a project that you want to show off, you want to ask others for help with, or that you just want to work on. We are currently in the process of moving to a new space on 800 N. Mangum in Durham. This meetup will be a moving and work day for our members. You are welcome to come check out our new space, but pardon our mess! We should be back to business as usual in January, but even better in the new year in a new space! Please check back with us! We were formerly in the basement below Beyu Caffe @ 331 W. Main St.
Our new space is on 800 N. Mangum in Durham. We’re in the basement below Beyu Caffe @ 331 W. Main St. Parking behind the building on Ramseur St — there is plenty of parking and it’s free on weekends and/or as long as you exit the lot after 7pm. Bring your textile, paper, jewelry, fiber, metal, or any type of craft project to the space. 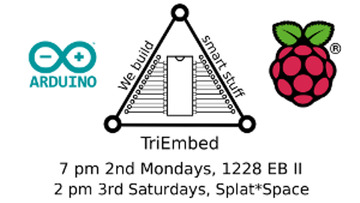 Join us for the local Durham TA3M , held the third Monday of every month at SplatSpace in Durham ! It’s time again for another Hack Afternoon at SplatSpace! No prior experience is required to attend hack afternoon and you don’t even need to own an Arduino. There are plenty of members who will be glad to let you look over their shoulder and ask questions. Some will even hand you some parts and let you tinker. If you have your own parts, definitely bring them. We have lots of space and everyone should have room to work on a reasonably sized project. You don’t need to be a member of SplatSpace in order to attend, but please do ask about the membership options while you’re there. It’s a great group of folks and, if you’re into embedded computing there’s a good chance that you’ll share interests with other attendees. If anyone has projects they’d like to collaborate on, feel free to start a conversation on the http://mail.triembed.org/mailman/listinfo/triembed_triembed.org mailing list. This announcement has also been cross-posted to that list. If you follow our blog a lot, you may have noticed that for the last few months the weekly schedule post has a) been more reliably on time and b) been pretty regularly formatted. Creating the weekly schedule post used to be a very manual task, requiring someone to go through the meetup listings and write the entire post by hand. This was error-prone, time consuming, and on more than one occasion resulted in late or no schedule being posted. That really sucked for people who were interested in events that occurred early in the week. There’s no good reason for this. Meetup has a well developed API, and our blog runs on wordpress which has a great API too. To that end we automated it: for the last couple months the schedule has been posted with mwp, a meetup-to-wordpress crossposter designed to post the coming week’s schedule to a wordpress blog. We figure there’s a chance other people might have the same use case, so we invite you to give it a try, file issues against it, and contribute code to it. Happy hacking.